Pass Me the Quill and Ink Bottle. I’ve Got a Post to Write. I am a techie. Always have been. 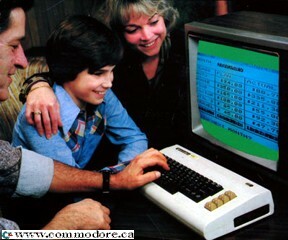 In 1981, I begged my parents to purchase a computer and was THRILLED when they finally agreed. They brought home a brand-spanking-new VIC20! I was the happiest 10 year old around! There’s nothing wrong with the photo.We lived in lower resolution back then. Over the years, I’ve embraced changing technology. (Hey, we upgraded to the Commodore 64 not long after!) 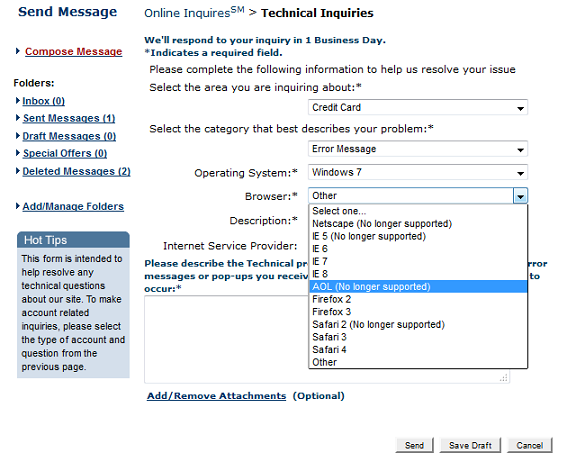 As a result, I’m always a bit perplexed when businesses think that staying current with technology is optional. My retired father – pushing 70 – uses the Web for all of his banking. The integration of technology tools into every industry is an unstoppable process. E-business is a fact for almost any industry I can think of. For the last couple of months, I’ve been annoyed at an odd quirk in the website for a credit card I hold. Although I’m using a modern, up-to-date browser (Chrome, by that quaint little tech start-up Google), the website’s Message Center throws an error every time I try accessing the messages from the bank. Every. Single. Time. I don’t think this apology is sincere. Especially since I’ve seen it 14 times. This morning I had enough and decided to confirm my suspicion. This is not an odd quirk of timing or some Web server that just went on its virtual coffee break. The website doesn’t like Chrome. Let’s confirm this. I fired up Firefox, my backup browser, and logged onto the website. I clicked the link for the Message Center. Yup. My new messages came right up. No validation error detected. I knew it! 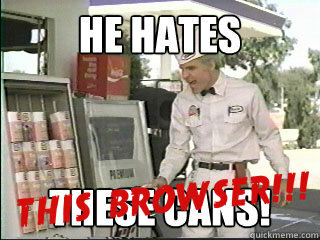 This website hates Chrome! I decided to do my good deed for the day. Why not drop a quick note to the bank and point out that, with 25% of market share, Chrome should be supported by their site? A few clicks and I was ready to pass along this unsolicited feedback. Select the category of my issue, pick my OS and browser… huh? Please tell me you’re kidding! I’ve got Firefox 38 so, although the browser is listed, I’m a step or two (or 35) ahead of them. At least they have the grace to acknowledge that Safari 2 is no longer supported. I remember Netscape. And AOL… well, you can’t mail out 4 bajillion CDs and not expect the browser to have some legs. That thing is going to last for a while. Like herpes. I don’t have a lot of confidence in this bank. Anyone know where I can cash out these dollars for something a bit more stable? I hear that these Beanie Babies are all the rage. All of the kids are into them now. That seems like a smart bet. Pushing 70???????? You’re out of the will.